Power for a followup study? A small group of Quantified Selfers tested themselves daily on arithmetic and engaged in a month of meditation. 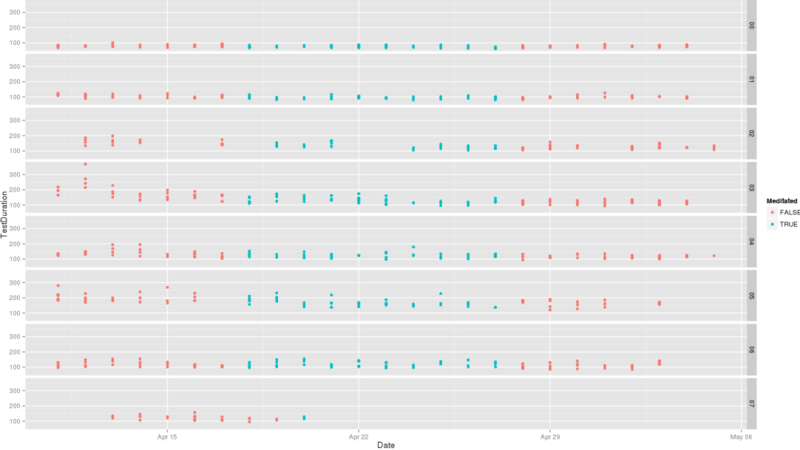 I analyze their scores with a multilevel model with per-subject grouping, and find the expect result: a small decrease in arithmetic errors which is not statistically-significant, with practice & time-of-day effects (but not day-of-week or weekend effects). This suggests a longer experiment by twice as many experimenters in order to detect this effect. 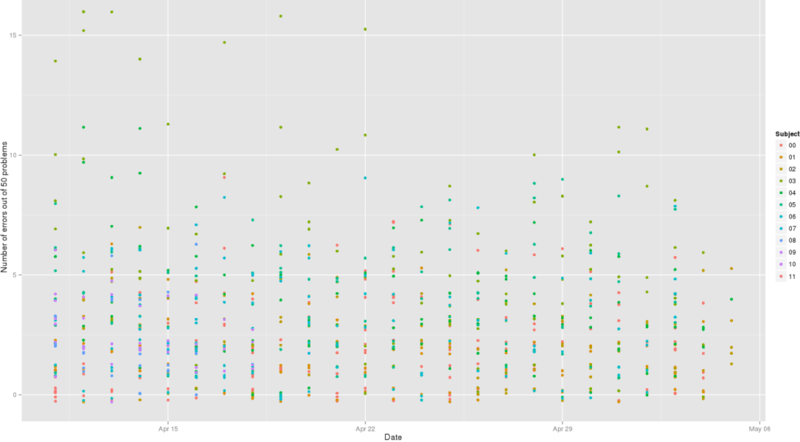 Quantified Self hobbyist Peter Lewis in April 2013 began a self-experiment with 11 other hobbyists (with the results posted on Seth Robert’s blog): they used a cellphone app “Math Workout” to do timed simple arithmetic problems (eg. “3.7 + 7.3, 93 + 18, 14 * 7, and 12² + √9”) in an ABA experimental design, where B was practicing mindfulness meditation. This was motivated in part by the observation that, while there is a ton of scientific research on meditation, the studies are often of doubtful quality (he cited a remarkable 2007 collection of meditation meta-analyses). Lewis thought the results were positive inasmuch as his timings & error rate fell during the meditation period and the falls seemed visually clear when graphed, but some of the participants dropped out and others had graphs that were not so positive. The interpretation of the data from a statistical point of view was not terribly clear. Lewis & Roberts did not do the analysis. Reading the post, I thought that it was a perfect dataset to try out multilevel models on, as this sort of psychology setup (multiple groups of data per subject, and multiple subjects) is a standard use-case. We can clearly see a practice effect in both test duration & number of errors, where subjects are gradually getting better over time. We will need to remember to control for that. Overall, these are looking equivocal. There might be something going on, there might not be - ErrorCount looks better than TestDuration, but in both cases, the clear practice effect makes comparison hard. Another way to improve this experiment would be to do statistical tests that generate p values; this would give a better indication of the strength of the evidence. Because this experiment didn’t reach steady states, the best tests are complicated (e.g., comparison of slopes of fitted lines). With steady-state data, these tests are simple (e.g., comparison of means). If you are sophisticated at statistics, you could look for a time-of-day effect (are tests later in the day faster? ), a day-of-week effect, and so on. If these effects exist, their removal would make the experiment more sensitive. In my brain-function experiments, I use a small number of problems so that I can adjust for problem difficulty. That isn’t possible here. p-values are standard in psychology, of course, despite their conceptual & practical problems which help contribute to systematic problems in science, so we’ll calculate one. But we know in advance what the result will be: greater than 0.05, or non-statistically-significant. A p-value is mostly a function of how much data you have and how large the effect size is - we know a priori that this is a small experiment, and we also know that the effect of meditation on arithmetic scores cannot be huge because otherwise we would have heard of the groundbreaking research & society would make kids meditate before standardized exams & the subjects didn’t do much meditation & they were inexperienced etc. A small experiment on a small effect is guaranteed to not turn in a statistically-significant result, even when there genuinely is an effect, because the experiment doesn’t have much statistical power. In fact, a decrease in errors large enough to reach a statistical-significance of p<0.05 would be so bizarre & unexpected that it would be grounds for throwing out the data entirely, as someone must be lying or have screwed something up or something have gone terribly wrong somewhere. In this view of things, there’s a weaker effect of meditation: 1/7th of an error less (rather than 1/5th). 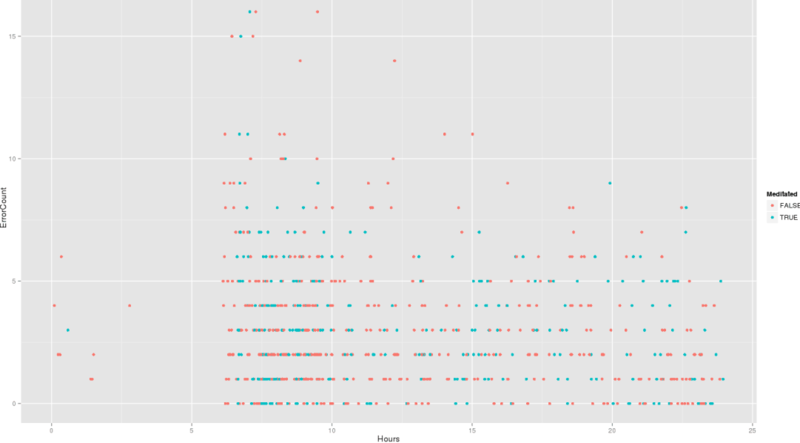 R> # what do the per-subject meditation estimates look like? Both agree that there is definitely a practice effect, it’s probably statistically-significant with such large t-values, and the effect size is cumulatively large - at -0.045 errors per day, we’d expect our error rate to decrease by 1.4 errors a month - which is a lot when we remember that the total average errors per session was 3.1! The lesson here is that doing arithmetic at 7AM is not a good idea. (Would that American high schools could realize this…) But moving on: I really don’t think there’s enough data to get a day-of-week effect as Roberts suggests, so I’ll also do a simpler split on weekends. mdtt$WeekEnd <- mdtt$Day=="Sunday" | mdtt$Day=="Saturday"
Neither one is impressive. 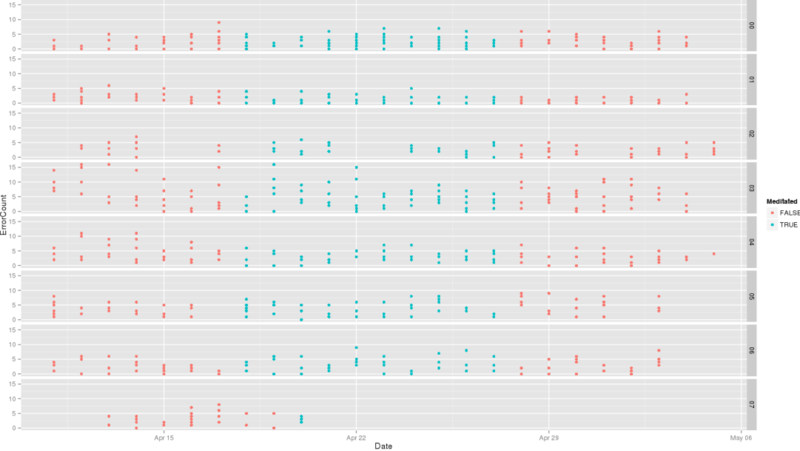 The model using weekends is completely useless, while the model using days looks like it’s overfitting the data. Which of the 5 models is better, overall and keeping in mind that simplicity is good (we don’t want to overfit the data by throwing in a huge number of random variables which might “explain” variation in error-scores)? So, in mlm3 the meditation coefficient was -0.1875. How reliable is this meditation coefficient? We’d like a p-value, and the t-values aren’t clear: -1.106? The practice & time-of-day effects are pretty statistically-significant, but we get a p-value of 0.29 for meditation at -0.15 (-0.54-0.15). 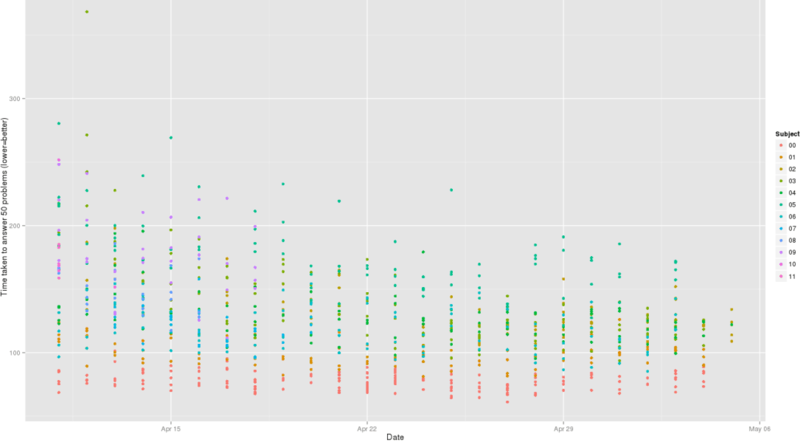 To put this in perspective: the dataset just isn’t a whole lot of data and the data is heavily loaded on non-meditation data - not such an issue for the date or time-of-day effects which get spread around and estimated evenly, but bad for the meditation data. Another check is by bootstrapping our model from the data and seeing how the meditation estimate varies - does it vary like it did above? Lewis viewed the collected data as a proto-study, and wants to do a followup experiment which will be better. Besides the obvious methodological improvements one could make like explicitly randomizing blocks of weeks & using better controls (some other mental activity or alternate form of meditation like yoga), how big should the experiment be so that a meditation effect could reach a p<0.05? If I’m interpreting the power right, this is not as bad as it looks since each of those n is one math-game, but still. If you have 10 participants and each does 4 games a day, then you’ll need each of your 10 participants to spend 64 days playing the game without meditation (2544 / (10*4) = 64) and another 50 days playing with the meditation. If you could get 20 participants then it’s a more reasonable 2 months total each. the value of meditation is over-determined by all the existing research, which in aggregate covers probably hundreds of thousands of subjects. 10 or 30 QSers’ data should not, for a rational person, override or noticeably affect one’s beliefs about the value or meditation. If the existing research says meditation is worthwhile, that is far more trustworthy than this; if it says meditation is not worthwhile, likewise. the methodology here means that the small effect is not a causal effect of meditation alone, but an unknown melange of countless factors. What the small decrease means or is caused by, I am agnostic about. I know a lot of people get annoyed when someone brings up methodological issues like expectancy or placebo effects, but with my own blinded self-experiments with nootropics I have felt first-hand placebo effects, and I have been deeply impressed by the results of my dual n-back meta-analysis where simply switching from a passive to an active control group changes the IQ gain from 9.3 IQ points to 2.5. For me, things like that are the reality behind most self-experiments, and certainly ones with self-selected participants in an unrandomized unblinded experiment with attrition leading to a small effect easily explicable by simply trying a little bit harder. No one actually cares about simple arithmetic scores. Many results in brain training studies follow a pattern where the training successfully increases scores on some psychological task like digit span, but when researchers look for “far transfer” to things like school grades, no effect can be found. Even if all the other issues could be dealt with and mindfulness meditation did improve arithmetic, what is it a valid proxy for?